Posted in: Discussion. Tagged: books, excel, organization, reading, tbr. Though it’s an idea I first heard of years ago, it seems the TBR Jar is becoming popular again. I’ve seen a few bloggers recently embracing this idea. You stick scraps of paper with titles of all the books you own but haven’t read in a jar, and pick one to choose your next read. I LOVE the idea, but it’s not really a practical one for me, mostly because my TBR is entirely virtual. I don’t have shelves and stacks of books sitting around my house that I haven’t read yet. I have an ever-evolving pile of library books. I guess I could have a jar that tells me which books to check out that week, but they might not always be available, and besides, the whole point of the jar is so that you can pick up a book and start reading right at that moment, with no thinking or second guessing. I could have a mini-jar just with the titles I have out at any given time, but then I’m completely disregarding due dates, and I’d probably end up returning a lot of books unread (more than I already do). Anyway, the jar thing just doesn’t work for me. But the purpose of the jar is to make your out-of-control TBR more manageable. That, I have a need for. But if I can’t use the jar, what can I use? This is my Excel spreadsheet. I have four different tabs. The main one that I work off of is the first tab, what I call my shortlist. But usually it takes a while before a book ends up here. When I see a book that interests me by an author I haven’t read before, it goes on the new author list. I make a note of where I saw it or why I’m adding it to the list. I also look to see if my library currently has it; if not, I italicize the title. Occasionally I’ll re-check to see if the book’s been added… sometimes it just takes them a while to get newer releases, if there wasn’t an immediate demand for it when the book was released. But if it’s a book I really want to read and they still don’t have it, I’ll put in a purchase request. More often than not, they’ll add the book to their collection. Otherwise I have the option of paying for an interlibrary loan. When I read a book that I enjoy, I’ll see what else the author’s written, and add those books to my continuing author list. This is actually woefully out of date; I don’t think I’ve added any recently-discovered authors’ books in at least a year. But since I also keep a spreadsheet of the books I’ve read, it’s not really a time-sensitive issue. I like keeping these two lists separate, because when I’m pulling titles for my short list (more on that in a bit), I can try to keep a good balance between working through backlists of familiar authors and branching out reading new authors. And then there’s the ITW must-read thrillers. It seems a little ridiculous that I’ve already written so much and still have more to say about this… I guess that just proves how much of a nerd I am. But I think I’ll end it here for now. Check in next week for more on my patented* TBR management system. How do you keep track of books you want to read? And how do you decide which book to read next? I don’t keep track of books I want to read. Unless it is something I really really don’t want to miss. Hmm, I suppose that would solve the problem. I do sometimes go through phases where I won’t add to the list unless it sounds like something I absolutely have to read… but then there are other times when I’ll add anything that looks remotely interesting. Wow, I’m blown away by your organization! Since I’m moving soon, all my physical books are packed and I’m reading my kindle exclusively. For me, reading a kindle book is *always* a random crapshoot as I rarely remember anything about why I put the book on there in the first place. So my “system” is to scroll through the list and just pick a book to read based on whether the title appeals to me at that moment in time. It’s the luck of the draw! My list used to be very similar – “wait, why did I add this again?” – until I started leaving myself notes. Often I’d go back and pick a title and read the book description… and it wouldn’t sound at all interesting! And then I was stuck wondering what I’d heard about it that made me want to read it. Was this your system pre-Goodreads? Why not just use different shelves? I ADMIRE you system. My system (which doesn’t even deserve to be called a system) is something along the lines of…”Have I read that one? (scratches head). I’m normally super organized, but lately I’ve just fallen off the organization wagon. I don’t know what’s going on. I think the jar system is cute, but it’s about as likely to happen as the Kardashians are to disappear. I’m hopeful (but not expectant) on both fronts. I’ve found I’m much better at being organized with things that aren’t really important. I’ve got all this done, but haven’t balanced the checkbook in months. Adulthood: I’m clearly rocking it. I use GoodReads to keep track of all books that interest me by adding them to my to-read shelf. If I’m really keen, I also put it on my wishlist shelf. 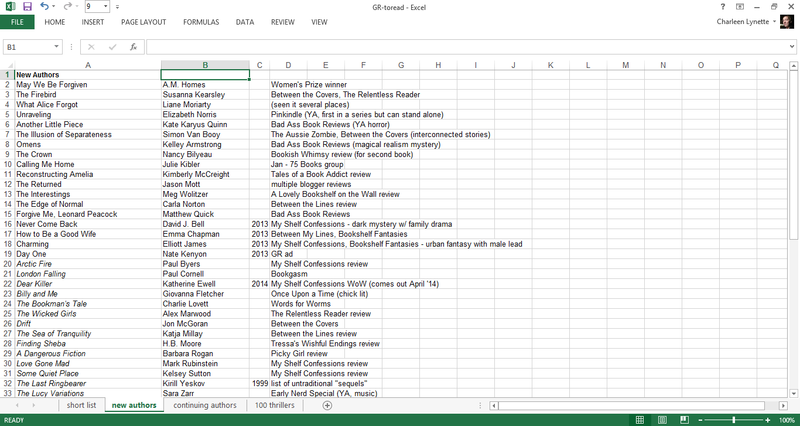 For books I actually have, I track them all on Excel (and Goodreads!). 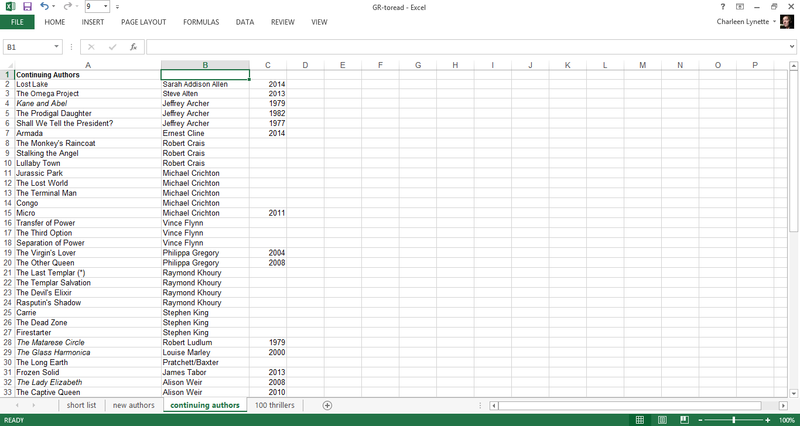 I just find Excel the handiest as I can track sources, publication dates, etc. I like the idea of the jar system but I’m very much a mood reader so I know I’d just keep dipping till I found something I felt like reading which would defeat the purpose! Your non-patented system (lol) seems to work well for you. That’s what I love about Excel, you can personalise it so it meets your exact needs. Yes, Excel is amazing. I never use it for math-type things… you know, what spreadsheets are actually meant for… but it’s my favorite organizational tool. I have to have a complicated system of excel spreadsheets too. So glad I’m not the only one. My problem is that I don’t want a random book, I want a book I am in the mood for so a jar wouldn’t work for me either…. That’s a good point. I’ve heard of other readers having a jar (or using a random number generator, so same idea) to pick a random read once or twice a month… so it’s not something they’re tied to all the time, just a little something to help work through those books that are consistently overlooked. Thanks for stopping by! I never used to, but found myself wondering so often where I’d heard about it (especially when I suddenly looked at it and it didn’t sound at all like something I wanted to read) that I decided to start making better notes. There are still books on the list leftover from the days when I didn’t, though. I primarily use Goodreads now, or just browse Amazon/the bookstore/select book blogs/library for new books to read. Although usually, I’m not looking for new stuff, I’m looking for stuff I already want to read. I have a stack of books on my nightstand that are more likely to be read next, and the rest are on the shelf in my living room (most of them are already read don’t want to get rid of, or to read I probably won’t get to for awhile) and then I have my Kindle which keeps me busy most of the time, except when I’m broke and can’t buy them.) It’s kind of a fly by the seat of my pants type of thing. Like I was going to do Summer of Jest and ended up making it Summer of Dark Tower instead. My next post is going to be how I take my existing lists and choose what makes it onto the “short list.” Despite trying to stay organized, a lot of it is just a gut feeling on what sounds good at the moment. Hello again. Good work, I like the idea but think I’d lack the discipline. Before e-books I used to get books from charity shops and always had a pile by the side of the bed. I’d recommend going one step further. In my blog I recommend not choosing books (see http://blissfullyignorantreading.wordpress.com/2013/06/13/how-do-i-notpick-a-book/) but use recommendations to choose them for you. That way you end up reading new good books that you would never have picked yourself. Thanks for ideas. Isn’t it great that us nerds can now be proud of it? Pretty much every book on this list was a recommendation from somewhere. That’s the trouble… too many recommendations, not enough time to get through them all! Wow!! I thought MY TBR was getting out of control…It’s too late for me to remember and write down all the titles I’ve already read, but I’ve recently started a word document to which I add the titles of books I want to read – and it’s getting longer every week! I have a printed spreadsheet of all the books I own but haven’t read. I don’t have a method for picking what I read next–either I pick according to projects/group reads, or I just pick whatever sounds good at the time. Oh, and I just use GR to keep track of books I’d like to read but don’t own. I choose partly based on mood, partly based on due dates/planning… basically I try to plan what kind of a mood I’m going to be in. It doesn’t always work out. I have a list of the books that I have read. I have just recently started putting a list of authors and titles that I would like to read. You are way ahead of me. Please don’t forget to enjoy the reading. thanks for you input. Ha, yes, enjoying it is the most important part! I love hearing how other people organize their books and lists! I’m a big list person so I am weirdly entertained by it. Can’t wait to read the followups. I’m one of those people who makes purchase requests at the library too and so far, I have yet to be denied. Got to love a good library system! I’m the same way. I love hearing everyone else’s systems, even when I know they wouldn’t work for me. And yes, I’m so spoiled by my library. If I ever move to the middle of nowhere (like, the actual middle of nowhere, right now I’m basically somewhere that’s surrounded by nowhere) I won’t know what to do. I’ll just be stuck reading the 30 or so books I own over and over again. A TBR Jar sounds like an excellent freaking idea! I’m going to institute this asap! I have a spreadsheet also with all of the review books I have received. I don’t keep a list of my TBR books they are just all over my library and ereader. If I REALLY want to read a non review book I put it on my review spreadsheet or I just randomly grab it from the shelf when I’m in the mood for it. But what about all those purchased books I’ve been letting slide to the way side! I think I’m going to make a couple little jars this weekend. A adult fantasy/UF jar, adult SF jar and a young adult jar for all my books that are on my TBR. I still have to continue to read off my spreadsheet but those are books I requested and am dying to read anyway. I like the idea of multiple jars! That way you can still read based on what you’re in the mood for, but with some randomness to it. Wow, you’re so organized! I have a TBR list on goodreads, but it’s something of a joke since I almost never use it to pick which books I’ll read next. I do have a to-doist list for my planned posts, but reading that doesn’t have a deadline isn’t something I really keep track of. Ha, thanks! I started my TBR on Goodreads but it got too unwieldy so I opted to move it to a spreadsheet (where it got even more unwieldy…). I was going to go into some of that in my Part Two post, whenever I get around to writing it. I’m a total Excel geek, and I had to laugh when I saw this. I just finally put all my ARCs and NetGalley approvals on a spreadsheet, after trying to either wing it or use a calendar for a while… and it’s working amazingly well! I have it organized by publication date, with references to source, target review month, etc. I finally feel like I’m getting in control! So far, in terms of stuff I just want to read, I’m still relying on my Goodreads to-read shelf. In terms of reading strictly for pleasure (vs books I’ve committed to reviewing), I still like to wing it — I mostly grab books on a whim, and see where it goes. But hmmm…. I do like your system! 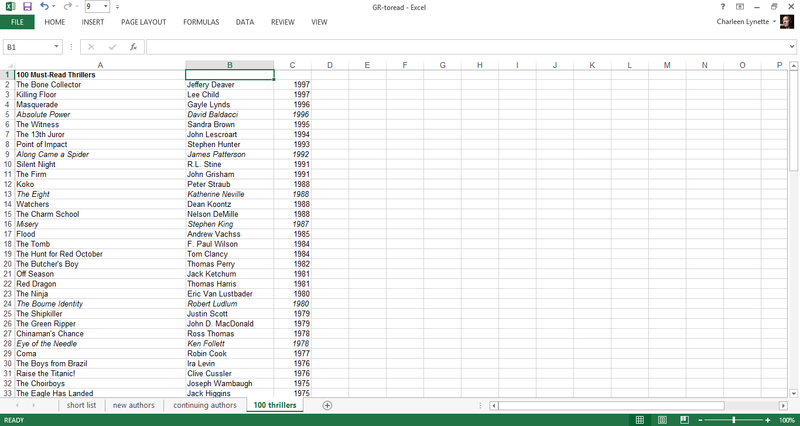 I’ll need to give some more thought to expanding my bookish Excel use! These are really great. Congrats! I consider myself a pretty casual blogger, so pretty much all reading I do is just for my own pleasure. I was using this system for a good couple years before I started blogging. Now that I do request the occasional NetGalley ARC, I just stick those directly onto my short list, and so far I’ve done a good job of getting to them before the file expires. I don’t always get those reviews up as close to the release date as I probably should… maybe that’ll be my next organizational step. I am an excel geek too. I keep a worksheet for all of the books I own or have been approved to review. I keep them allone sheet sorted by publication date but highlight review books to separate them. Then once I have read them I strikethrough and note when I’ve written/posted my review, my rating, and whether I cross posted to Goodreads/Amazon. Its worked well for me so far, since it’s difficult to keep track of which books are on my kindle and I can’t physically see them. I also sporadically add books to my to-read shelf on goodreads just so that I remember the title, and any I really must have I add to my Amazon wishlist. Excel is a great way to organize! 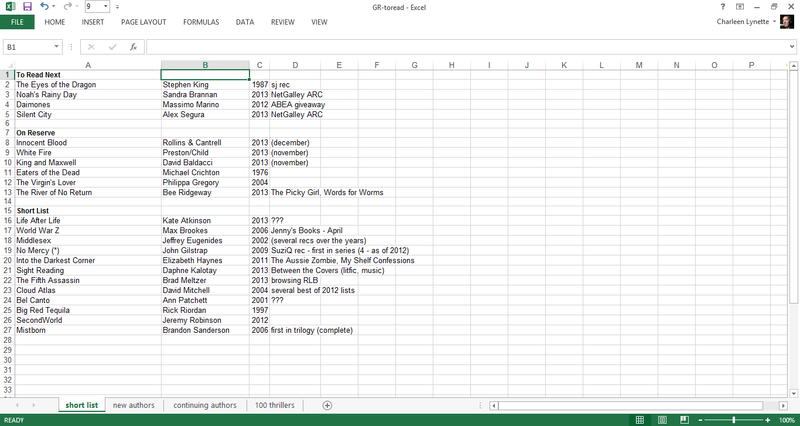 I’ve been using this system since before I started blogging, and I have a separate spreadsheet for the books I’ve read. I’ve been thinking, though, that maybe I need to add some more columns, incorporate color, something… to keep track of things that are more blog-specific. I’m so glad I found this post. I’ve been intrigued about your TBR Management System for a while. I could never use a system like this (I’m far too lazy), but I love seeing how other people keep track of their reading lists. Glad you liked it. I’ll be writing the next part of my post next week (hopefully). Thanks for stopping by! You’re so organized! I love this idea, but in reality I think if I did a spreadsheet, it would quickly get unwieldy. Also, for better or worse, I am very visual when it comes to book covers — I like browsing my TBR on GoodReads because covers jog my memory better than a title alone and I have easy access to the book’s description if I’m still not recalling all the details! I really do like distinguishing between new authors and continuing authors though — I may need to figure a way to incorporate that. I also commend you on being able to actually create a short list — any time I have tried, I end up putting so many books on it it’s practically useless! My mood is a big factor in what I choose to read next, so I’m always wanting to put all different kinds of books on my “shortlist” just in case! It works for me, but I can definitely see how it wouldn’t work for everyone.